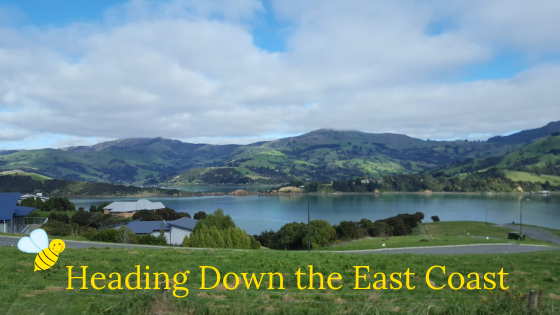 We headed down the winding roads from Akaroa towards Ashburton where we stopped for lunch – to be honest, there isn’t much here and we should have planned our stop better!! 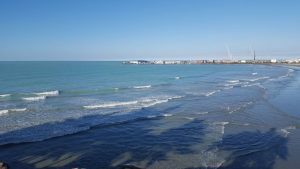 We then continued down the East Coast towards Timaru arriving in the late afternoon. After checking into the Top Ten Campsite, choosing DVDs for later and getting directions to walk in town, we pitched up and explored the site a little. 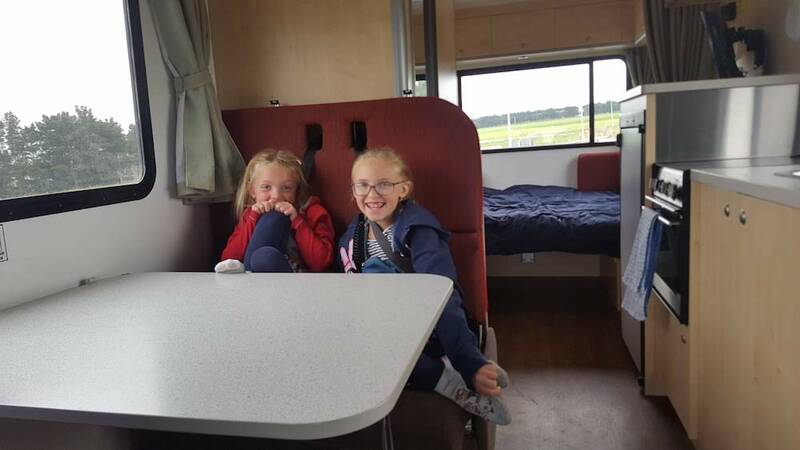 The girls loved the play area and jumping pillow and we were very impressed with the facilities at this site. 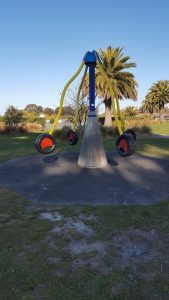 A short walk through the residential area leads us to a small park area which we walked through to the coastal walk to Caroline Bay. Having visited here 11 years ago and being impressed with the bay then we were pleased to find it just as stunning second time around. 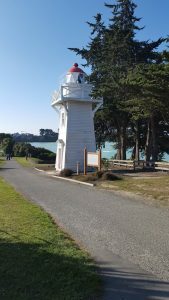 Back then we were looking at Timaru through the eyes of a young couple but this time we saw it as parents, as well as the boardwalks through the dunes, there is a large childrens play area, small aviary and even a paddling pool for when the weather is a bit warmer (we were here at the end of Winter!). 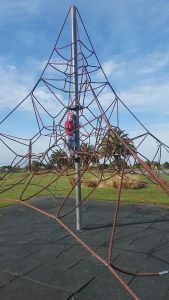 The girls had lots of fun on the play area whilst we questioned the health and safety standards as they ran around in a hamster wheel and flung themselves around a pole on tyres! 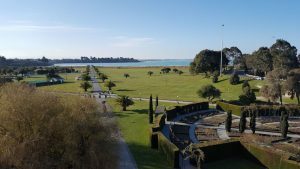 We took a slow walk back via the rose garden (not in bloom this time of year) and the Piazza lift that takes you back to street level from the bay – we were surprised it was working after all these years. There are stunning views over the bay from the top. Heading back to the campsite everyone was ready for some food, so we had a chilled evening utilising the fantastic cooking facilities. 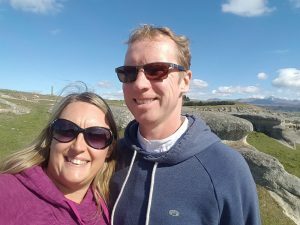 Having decided to relax on our first evening here, we made the decision to stay a second night so that we could go and see the penguins that we had told about near the port in Timaru. So we had a second day to spend in the town exploring further. 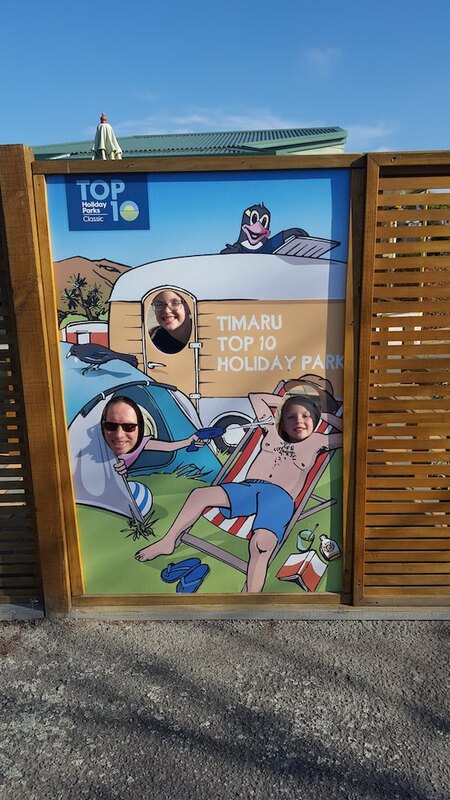 As the girls were missing swimming – it had been a while since we stayed anywhere with a pool we decided to go to the Caroline Bay Trust Aoraki Centre which has fantastic facilities including a splash area for kids, rapids and a big pool for lane swimming for the adults. We would highly recommend this leisure centre and if you book your tickets via the campsite you also get a discount, however by UK standards, this is a really cheap place to go swimming. Our afternoon was spent exploring the town, walking around the bay again and stocking up on supplies ready for the following day. As night started to fall we headed out to the port area to try to catch a glimpse of the Little Blue Penguins which are the smallest penguins in the world. We parked up and started to walk along the rocks, along with a lot of other people trying to catch a glimpse of them. After a lot of patience and telling the littlest bees to be quiet we spotted our first penguin and once we realised how small they actually are (no more than 40cm tall) managed to spot 3 in total. One was so close we could almost touch it was an absolutely amazing experience and definitely not one to miss if you are in the area. If you would like to know more about these penguins or see what they look like (they are scared of flash photography so we have no pics) check out the Timaru Penguins website. 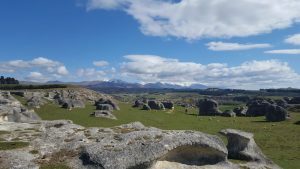 After our second night in Timaru, we decided we would head for our first freedom camp and started our drive South from Timaru. 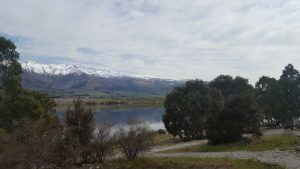 Our destination for the night was the DOC Site – Ahuriri Bridge. 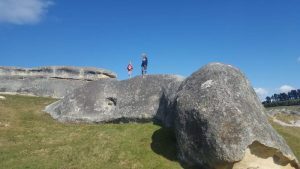 Our drive us down SH1 and we turned inland on SH83 to visit the Elephant Rocks at Duntroon – these amazing rocks form part of the Vanished World Trail and featured in the Narnia Film – The Lion, The Witch and The Wardrobe. The girls were amazing as were we by the shapes of the rocks and the amazing views across the site. 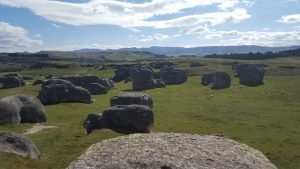 We spent some time exploring these before heading back for a picnic lunch. 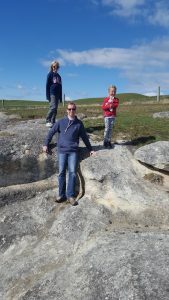 Continuing along SH83 we stopped at the Takiroa Rock Art Site to look at the fantastic Maori Rock Drawings – many of these have faded or were removed by European settlers but evidence of them still remains. 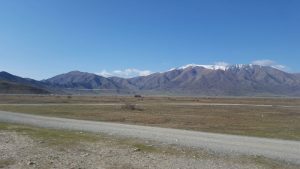 Our route to Omarama took us through the Waitaki Valley and its stunning views over the snow-capped mountains, along rivers and past many waterfalls – one of our favourite past times on the road was to spot waterfalls! 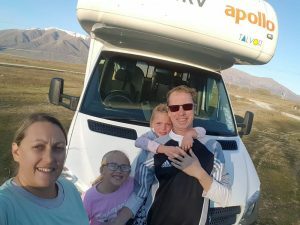 Before we knew it we had located our beautiful and isolated campsite for the night and after checking it out we headed back into town for a coffee, play on the local park and to top up our water bottles as the site only had river water available! 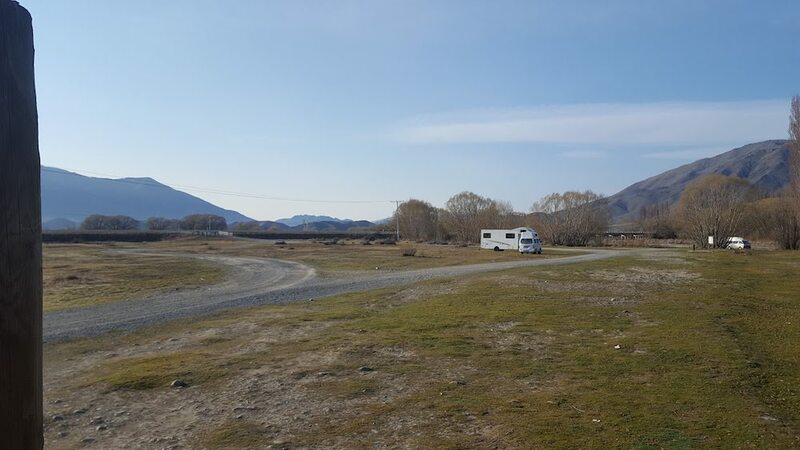 I guess that a DOC site isn’t actually freedom camping, but as this was a basic site with only a composting toilet and river we think it is the closest we will get to proper freedom camping! 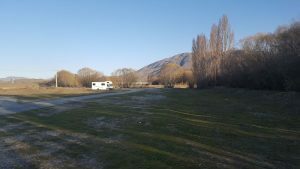 As our photos show the site wasn’t busy and we settled on a spot for the night and then headed to the river for a walk and to fetch some water to boil for cooking. 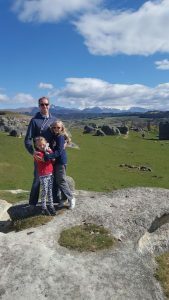 After being distracted by a rabbit we got slightly lost in the wood and think we may have walked a slightly illegal route back to our camper – sorry NZ! The girls played whilst we prepared dinner and surprisingly for somewhere so isolated Sarah was able to get some internet connection to work whilst looking out at the sunset. 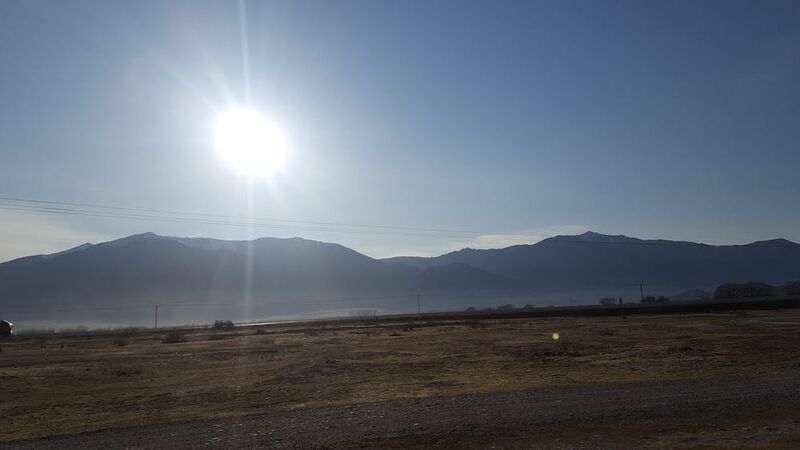 After a slightly chilly (we didn’t have the gas heater on for long enough) night, we awoke to the most stunning sunrise over the mountains and made breakfast before heading off on the next part of our adventure. Oh and before we left we discovered that we had neighbours – surely they could have parked up a little further away on this very busy site!! !